What if the Future Thaws? I am still figuring out how to adapt to our new socialist future. There are the foreseeable probabilities like widespread power outages, but it is harder to plan for the less predictable targets of government intervention. For example, when will the forces of the greater good turn their attention to the bank accounts of Big Orange? Orange Juice: Your daily breakfast OJ might not be as healthy for the planet as it is for you. Drinking 170 litres of water with breakfast would be ridiculous. You'd have your legs crossed all the way to work, which would be particularly problematic if you were doing the right thing by walking. But that's the amount that goes into manufacturing just one cup of orange juice, the United Nations Educational, Scientific and Cultural Organization says. Citrus is a thirsty crop. Then there's the fuel that goes into the tractors, pesticides, packaging and transport of OJ. In addition, orange production uses more pesticides than any other major commodity, the World Wide Fund For Nature reports. I could hoard frozen concentrate in the hopes of exploiting critical shortage situations, but what happens if the power to my freezers fails? Lola comes home and announces she is the only person in her department that shows up for work this Monday. I reply how wonderful it is that attendance is recommended but not mandatory. Unlimited sick leave is a fantastic benefit and I believe a standard feature of European employment. By the way, I tell her, you do realize all the 2008 Oscar acting winners are from the old world. I think Hollywood is in back in love with those societies our ancestors rebelled against so long ago. Piffle, she says, the Oscars are all about wardrobe. Before the Fashion Police broadcasts, however, she first races to the internet to introduce me to the work of Dengue Fever, a Cambodian pop rock psychedelic dance party! I reply they remind me slightly of the uptempo country, punk, rockabilly fusion with traditional Japanese Eenka and Kayokyoku roots as performed by Asakusa Jinta. As someone once said: “believe it or not there is a lack of psychobillypunkmarching bands in the United States”. Then it is my turn at show and tell and I inform Lola I have found the future of Madison. Behold the wonders of the Aquaduct Mobile Filtration Vehicle. Check out the winning bike from Innovate or Die Pedal-Powered Machine Contest, an event cosponsored by Specialized Bicycles and Google. The contest, which the two San Francisco Bay Area companies announced three months ago, sought “machines that transform pedaling energy into new and useful purposes,” with an eye toward the environment. 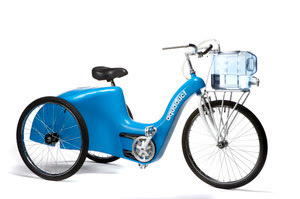 The winning entry, from a five-person team in Menlo Park, California, is a three-wheeled bike intended for people who lack access to clean drinking water. Built around a large tank, the Aquaduct Mobile Filtration Vehicle uses pedal power to run the water through a series of filters. If a rider reaches home before all of the water has been cleaned, he or she can disengage the wheels and continue pedaling—and, thus, filtering—while stationary. In the coming socialist future, the labor of our legs will serve not only our selfish need for mobility, but also the greater good of potable beverage. We have grilled turkey and cheese sandwiches then Lola retires to watch discussions of age appropriate ear rings while I continue to ponder The Truth About Islam in Europe. Via the Capital Times - a former newspaper gone electronic. Got electricity? April Wentz: Dear Editor: On Jan. 30, 260 conservationists, including myself, braved the freezing, snowy conditions to attend Conservation Lobby Day at the Capitol. Why did we brave the frigid temperatures to talk to our lawmakers? We believe in conservation priorities and our need to act now. I am particularly concerned about global warming because we have so little time left to act on it. Large coal power plants are being proposed and built throughout Wisconsin. This source of energy is dirty, dangerous, expensive and contributes to one of the biggest problems facing our planet: global warming. Carbon dioxide, one of the main culprits of global warming, is a consequence of burning coal. There is a way to reduce Wisconsin's global warming emissions. The state Senate needs to pass Senate Bill 81, the Safe Climate Act, which requires that the state reduce carbon dioxide emissions to 1990 levels by 2020. The current legislative session ends in mid-March. Contact your state senator and encourage him or her to pass the Safe Climate Act now. Environmentalists: Braving freezing snowy conditions because computer programming can make the basis of life appear to be something to be feared. I would like some specifics like, at exactly what temperature does warmth become harmful to life? April? April? Anyone? In the middle our historically cold and snowy winter the brilliant editorial minds at the Wisconsin State Journal apparently believe the Governor’s Task Force on Global Warming is addressing something based on reality. Find green ways to keep growing: Wisconsin should focus on how to support economic growth by generating and using energy in cleaner and more efficient ways. That theme should guide the Governor’s Task Force on Global Warming as it works toward its final report this summer. … Wisconsin ought to look upon the global warming challenge as an opportunity to lead, not an obligation to cut back. As long as we continue to allow the false belief that carbon dioxide creates unnatural and dangerous warming of the planet and equally false corollary that carbon dioxide is therefore a pollutant, then we will continue down the path towards expensive and inefficient, non-market based energy practices. The whole command control economy being advanced in America is built on these two lies. The Progressive: Obama Crushes Clinton in Wisconsin: Anatomy of Hillary’s Defeat. Her entire campaign has been flawed. “I’m Ready at Day One” was just not a winning slogan, and she kept repeating it over and over again, including Tuesday night. (By the way, she doesn’t know the meaning of “concession speech.”) Few voters go for a candidate by measuring that person’s résumé. And the slogan revealed a serious pronoun problem. The Clinton campaign was all about “I, I, I.” As in, “I’ve got 35 years of experience.” Or, I can take a punch from the right wing. By contrast, Obama’s campaign has been all about “We, We, We,” and “You,” and “You and I together.” He talks about change coming from the bottom up, from the voters themselves, and he asks them to join something larger than a personal campaign, whatever you think of the substance of that campaign. He asks them to redeem the promise of America. Hillary Clinton, via her campaign, mails me two pieces of light weight cardboard which arrive this election day. The first has a picture of Barack Obama and the second has two pictures of Barack Obama. I get the point. Hillary is to old and ugly to put her own photograph on her literature, so I go to the poll and mark my ballot for Barack Obama. Explaining the reasoning to Lola I am forced to retort that her mellifluous tone does not cover the stench of her sarcasm. This isn’t hard. I want all the old and ugly crooks cleaned out. The Obama administration will be illogical, corrupt and detrimental to American prosperity. I don’t care. I want new idiots. Heads up Southeast Wisconsin, The Antiplanner points out the choo-choophiles conveniently dropped a workable bus route idea because only rail based transit fits their development control desires. Trains are their only answer, regardless of price. A Commuter Train for Milwaukee? : Normally, the Antiplanner does not like to use names like “liars” and “cheaters,” preferring to let the facts speak for themselves. But, time and again, these words turn out to perfectly apply to the people who put together rail transit projects. Take, for example, the Southeastern Wisconsin Regional Transit Authority, or RTA for short, which covers Kenosha, Racine, and Milwaukee counties. Created in 2005, RTA wants to run a commuter-rail line it calls the KRM, from Kenosha through Racine to Milwaukee. The planned commuter line would run 14 round trips per day, which means each train would have about 240 people on board. That’s about five bus loads. So why not just buy five buses for each planned trainset and move people by bus instead? The newsletter explains that RTA considered a bus alternative, but it would attract only a third as many people as the rail line. It would also cost only an eighth as much to start up, so I always wonder why don’t they just invest three-eighths as much in buses and carry as many people as the rail line. But then I noticed that the rail line was projected to have seven stops between Milwaukee and Kenosha, while the bus line would stop 27 times. As a result, the bus would take almost twice as long as the train. No wonder it attracted so few people! The train would average just 38 miles per hour and RTA admits that it would not go significantly faster than motor vehicles, so there is no reason why buses could not be run on schedules similar to the train. So why didn’t they consider an alternative in which buses stopped only seven times? It turns out they did. The report from the consultant hired by RTA included a bus-rapid transit alternative that stopped fewer times than the regular bus alternative. It included some exclusive busways, so it cost a lot more than the regular bus alternative, but it would cost only half as much as the train. Moreover, it was projected to carry as many riders as the train. Naturally, RTA told the consultant to drop this alternative from further consideration. Anyone who travels understands the value of time which is why the America public voluntarily adopted personal transportation as the most efficient use of individual time. The key to understanding the KRM shenanigans is realizing the consulting firm develops a bus alternative with an equal number of stops that is as fast as train travel at much less expense, and was told by the SE Wisconsin RTA to deep six that part. The RTA retains a bus alternative designed to move at a glacial pace with 27 stops because Federal funding requires a bus based plan in the grant request. Does this report alteration rise to the level of malfeasance? Hard to say but worth asking the question. I suppose I should be looking for silver linings but my attention keeps drifting to the massive dark clouds on the horizon. Iran dismisses concerns over space program: Iran said Tuesday that its space program should not cause fear in the US, a day after Tehran launched a research rocket and Washington called it a troubling technological development. Iran has long declared the goal of developing a space program, but the same technology used to fire rockets into space can also be used to deliver warheads. "I don't see any reason for others' concern over the achievement," Iran's official news agency IRNA quoted government spokesman Gholam Hossein Elham as saying Tuesday when asked about US comments on Monday's rocket launch. Elham said Iran's space program was exclusively focused on scientific research, not weapons delivery. Iran testing advanced centrifuge: Iran is testing an advanced centrifuge at its Natanz nuclear facility, diplomats in Vienna said Wednesday. The new centrifuge would help Iran boost its speed of uranium enrichment. … Reuters reported that a senior diplomat familiar with the International Atomic Energy Agency's file on Iran confirmed that it recently began testing centrifuges based on a "P-2" design, able to enrich uranium 2-3 times as fast as the P-1. There is of also speculation that the first martyrdom homicide in over a year in Israel was a message from the Mullahs. China Confidential: Analysts tell China Confidential that Dimona was probably deliberately chosen because of its close proximity to Israel's (far from) secret nuclear research center. The Iranian message could well be: suicide bombers today; missiles tomorrow; if pressed, Iran will find a way to hit Israel's nuclear program. I’m quite sure the Iranian regime understands Western politics and knows full well the next American administration is going to rely almost exclusively on tossing words at them. Dane County Executive Kathleen Falk and her puppet Mayor Dave Cieslewicz continue working. with as little public attention as possible, to impose the eternal debt burden of inflexible rail transportation on Dane County. Their New Urbanist plan to limit personal transportation as much as possible is moving forward with the Dane County Board to hear RTA Referendum proposals this Thursday, Feb. 7, 7:00 pm at the City-County Bldg Rm 201. The Great Train Robbery: We are devoted to spreading information we think is crucial to prevent a disaster. The quality of life in Madison and Dane County and the economic strength of our community are at risk unless we defeat a proposal to increase a county-wide sales tax for trains and trolleys through the development of a Regional Transit Authority (RTA). The County has reportedly already applied for Federal Funds which are contingent on the County approving a new taxing body and collecting the adequate funds. Needless to say, Falk and Cieslewicz absolutely positively do not want this massive tax increase going to a public referendum which is exactly why a referendum is important. Do some homework and contact your representatives to let them know that affirmative public approval should be required before government makes a financial commitment, in perpetuity, of this magnitude. The delicious irony of the Democratic Party is that while their rhetoric is filled with claims of bringing the will of the people into the political process, like all statist control organizations, they have carefully structured themselves to dismiss the will of the voters if it gets inconvenient for the leadership. Since the left know themselves best, I’ll let good progressive Ari Berman of The Nation explain. Not So Superdelegates: If the race goes down to the wire, an elite contingent of superdelegates--unpledged party operatives and elected officials not chosen by primary voters--could play a decisive role, even though most voters don't know they exist. How could the Democratic Party be so, well, undemocratic? Rewind to the 1968 Democratic National Convention, which showcased the undue influence of the party's old guard. Big-city bosses like Chicago Mayor Richard Daley handed the nomination to Hubert Humphrey, despite Humphrey's support for a deeply unpopular war and the fact that he hadn't won a single primary. As Rick Perlstein recounts in his forthcoming book, Nixonland, Eugene McCarthy won 79 percent of the vote in the Pennsylvania primary but got less than 20 percent of the state's delegates at the convention. The rest were picked by the party machine. The will of the voters was ignored at the convention, and protesters on the streets outside it were met with clubs and tear gas. Despite the backroom double-dealing, supporters of McCarthy and Robert Kennedy were able to pass a rule at the convention mandating a study of how the party picked its nominee. … The new rules helped catapult two dark horses to the nomination, McGovern himself in 1972 and Jimmy Carter in 1976. By 1980 the party establishment had seen enough. It struck back with a commission of its own, led by North Carolina Governor James Hunt. It returned power to elected officials and party regulars--the superdelegates, who will make up about 20 percent of the 4,049 delegates at the Democratic convention. They include all Democratic members of Congress and every governor, but roughly half of them are Democratic National Committee officials elected by state parties, who range from top party operatives to local city council members. Key interests in the party, like labor groups, can also name superdelegates. According to political scientist Rhodes Cook, superdelegates were created as a "firewall to blunt any party outsider that built up a head of steam in the primaries." The fear of Obama supporters is that their candidate is exactly the type of neophyte party crasher the established elders designed this system to stop. The Clinton mafia is widespread and well financed. There is every reason to believe they are already strong arming the unelected 20% of convention delegates to support their third term. Over Dinner, Lola asks me if I would vote for John McCain and I tell her no. If we are to have a period of Federal Government dominated by socialist beliefs then I would just as soon have true socialists to blame for when things go bad. Wisconsin Blog Elder Sean Hackbarth posts the The Sharon Statement from almost half a Century ago. It is an outline a version of Conservative values based on the individual right of free will and the limitations of Government over the individual. One commenter makes the case that these eloquent expressions of political values didn’t produce the political victories of the 1980’s. The good things accomplished back then came from playing the game of elective politics, and for the last several years the Republics have been outplayed. I posted a link to a Capital Research Center paper a couple days ago, but it is worth a revisit and an excerpt. Democracy Alliance: Billionaires for Big Government. Corporate America now leans left. A year ago, six of the ten top-giving industries gave more to the GOP, but the watchdog Center for Responsive Politics finds that all are now giving more to Democrats. ... Of more than $577 million donated by business, 56% has gone to Democrats, 44% to Republicans. (FEC data as of October 29, 2007, from source). In 2006, Democrat-friendly donors dominated the list of the top 21 donors to 527s, the issue-driven tax-exempt groups not regulated by the FEC. They seem likely to do so again. The Service Employees International Union, an institutional member of the DA, topped the 2006 list with almost $33 million. Other top 527 donors associated with the Alliance include Soros Fund Management ($3,445,000), America Votes ($2,345,000), Peter B. Lewis/Progressive Corp. ($1,624,375), and the Gill Foundation ($1,181,355). Corporations and labor unions, which cannot give directly to political parties or candidates to federal office, may make unlimited contributions to 527s. The only (wink wink) restriction: the law forbids political parties and 527s from “coordinating” their activities. The numbers are telling a story. “Corporate America now leans left”. Not to be too cynical, but the Federal Government serves moneyed interests and always has served moneyed interests. The McCain Feingold Law (BCRA) plays right into the group expertise of the non-market sub-economy dominated by Democrats and they have fully utilized the rules for their advantage.